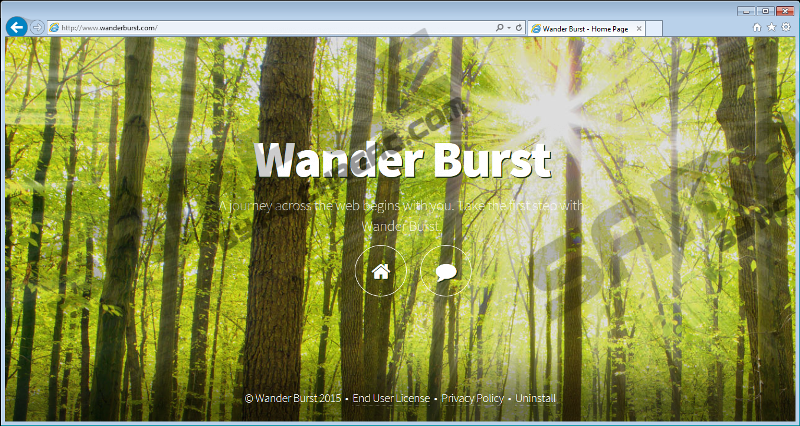 Wander Burst is one more adware program that has been roaming the web. Our reports show that quite a few users have their system infected with this invasive ad-supported program. If, unfortunately, you are one of such users you are highly advised to take immediate measure to remove it because this program holds no beneficial features whatsoever. On its official website, this ad-supported program is promoted as an excellent tool to improve your online experience. You must know that such advertising techniques are only used to trick naïve Internet users into downloading and installing this worthless program. Do not get fooled by such marketing strategies and make sure to stay away from this ad-supported program at all times. In this article, we provide security tips to boost your virtual security along a detailed removal guide that is easy to use and will help your delete Wander Burst in no time at all. To significantly reduce the risk of getting your PC infected with Wander Burst or any other suspicious program, you are required to take a few critical steps to improve your virtual security. First of all, make sure to avoid all third-party hosting sites as they are infamous for providing bundled installers. Such installers are often used by malware distributors to spread their questionable features. Thus, avoiding sites that provide them will reduce the risk of getting your PC infected. In addition to that you are highly advised to always choose the advanced installation method because it will provide you with maximum information regarding the setup procedures, meaning that you might be able to cancel the installation of a potentially unwanted application. It goes without saying that your best bet to keep your PC clean and secure at all times is by implementing a professional antimalware tool which would warn you about all the suspicious websites or installers beforehand while providing overall system security at all times. The functionality of Wander Burst is rather simple and is quite similar to adware programs such as Deals Avenue, Sale Charger, Dragon Branch and quite a few others. Once this adware program enters your operating system it will, like many of its counterparts, flood your web browser with unwanted third-party web content. It is important to note that this ad-supported program is compatible with major browsers such as Internet Explorer, Google Chrome, and Mozilla Firefox, meaning that no user is entirely safe. In most cases, the unwanted web content manifests itself as a banner ads, coupons, and pop-ups. It goes without saying that all of this unwanted web content will make your online experience far worse since you will need to close down multiple ads and pop-ups almost every time you decide to browse the web. Terminate this invasive activity by conducting a complete removal of Wander Burst without any hesitation. The removal of Wander Burst should be executed as soon as possible since this adware is known to be used by other Internet-based infections as a security breach to enter your PC in an easy way. In order to avoid getting your PC infected with some suspicious program in such a way make sure to scan your operating system with a professional antimalware tool to be sure that every single bit of Wander Burst has been removed from your PC. Right-click Wander Burst and then select Uninstall. Select Wander Burst and then click the Uninstall button. Quick & tested solution for Wander Burst removal.